This necklace is made of solid rhodium plated sterling silver and is stamped "925." 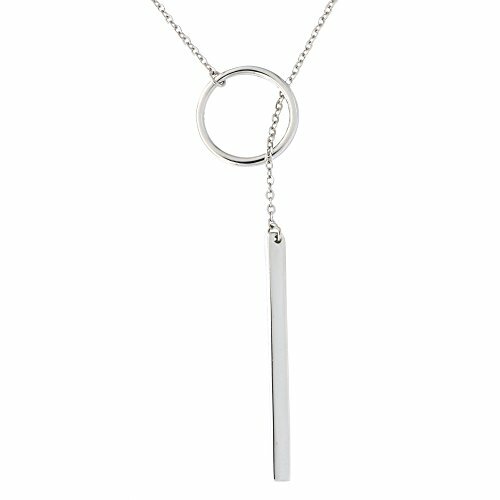 This classic necklace is perfect for everyday wear. The bar measures 2.5mm x 34mm (1 3/8 in), the circle measures 14mm (9/16 in). The chain is 1.3mm thick and 22 inches long (not including the circle and bar). The necklace weighs 3.01g. For best results, wrap the chain through the circle twice. Most of our jewelry is plated with rhodium to prevent tarnishing and give silver a more expensive, "white gold" look. However, unplated silver will tarnish with time when exposed to air and light. This is natural, and can be easily cleaned with a polishing cloth. Store your sterling silver jewelry in a cool, dry, dark place to avoid faster tarnishing, separately wrapped in a cloth to prevent it from being scratched by other jewelry.